Your arteries will groan but your tastebuds will sing for The 99 Cent Chef's latest breakfast recipe, Pastrami and Eggs. And it's so rich you may need your cholesterol checked afterwards! 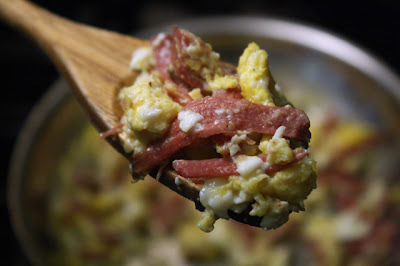 But so tasty, with peppery and spiced smoked pastrami mixed into creamy scrambled eggs -- it's too much of a good thing. 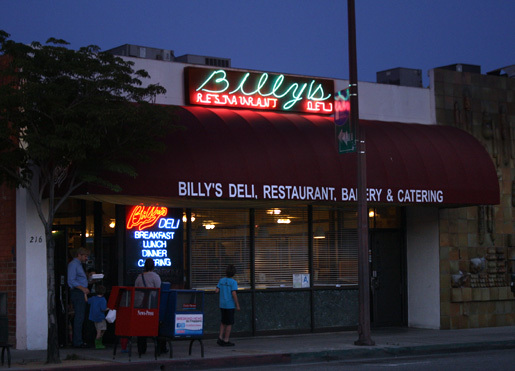 I first had Pastrami and Scrambled Eggs when I lived in the L.A neighborhood of Glendale at the local favorite old school Billy's Deli. Upon leaving the restaurant my only thought was "Were have you been my whole life, Pastrami and Scrambled Eggs?" While not as economical as making your own pastrami from a corned beef brisket (that I got for 98 cents per pound from Albertsons,) you could pick up some pastrami from you favorite Jewish deli or packaged pastrami from the grocery store. 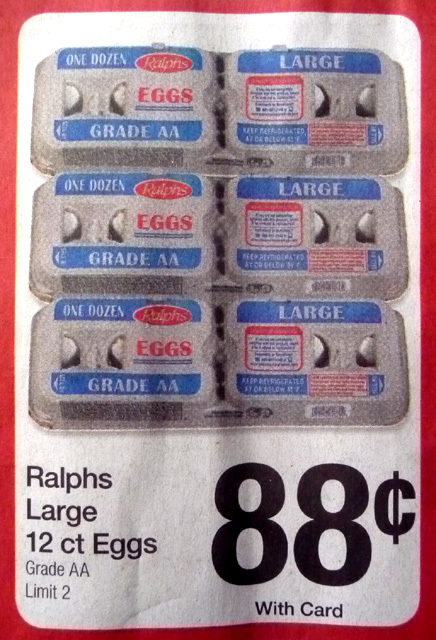 And eggs are always cheap. If you are like me, it's hard to finish a typical overstuffed Pastrami Deli Sandwich. So instead of eating it a day later on soggy bread, you can just take out the meat and use it in my Pastrami and Scrambled Eggs recipe. And there is nothing to it. Just heat up some cooked pastrami and stir in your favorite egg scramble. You don't even need to season it, as the pastrami is usually peppered and salt cured enough. This is a dish to make on a Saturday or Sunday morning, where you'll have the time to recover from my food coma inducing Pastrami and Scrambled Eggs. 1 to 3 eggs - scramble any way you like it. Leftover pastrami - shredded and roughly chopped. A pile that equals the size of one egg is a good serving. Of course, you can use as little or a much as you desire. 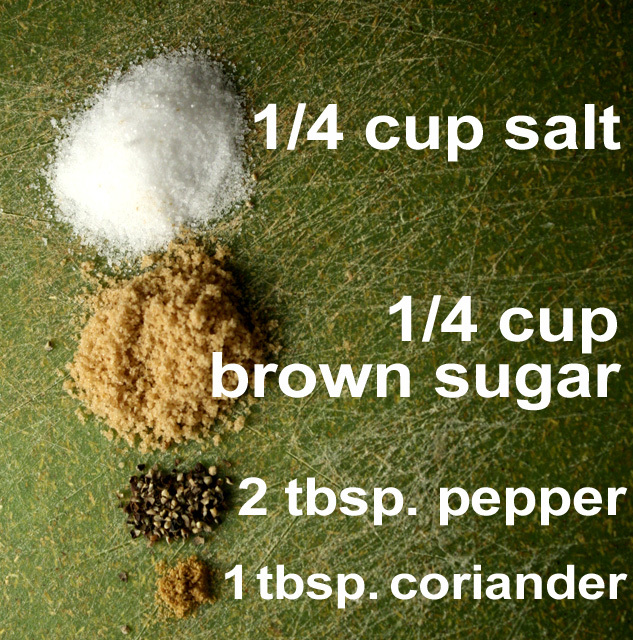 No need for salt and pepper, as pastrami is seasoned enough for me - but you can add some if you like. A little bit of cooking spray or oil -- optional. I left it out as the pastrami leftovers came off the fatty ends, and were oily enough. Heat up your omelet pan over a low/medium heat. Flake or peel off pastrami pieces from leftovers. Roughly chop the pastrami. You can oil the pan if necessary. Saute pastrami for a minute -- just long enough to heat it through. Break in 1, 2 or 3 eggs and start scrambling it all together. 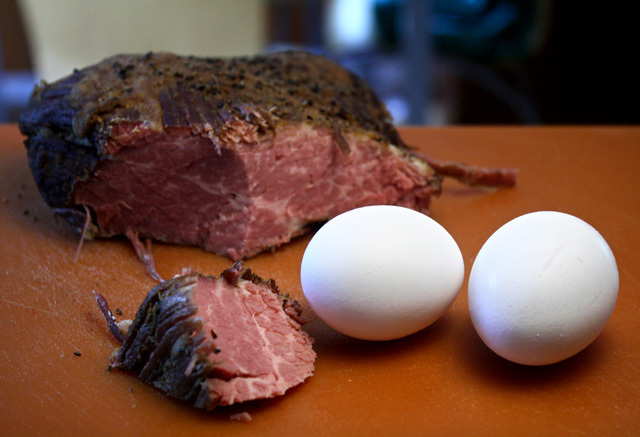 You can whisk the eggs first, then add to heating pastrami. Just make your favorite egg scramble recipe. Cook to desired doneness, it should only take 3 - 5 minutes. Serve with any favorite sides like: toasted bagels, bread or sliced tomato and cottage cheese -- although it's such a hearty breakfast you may only need coffee. Make this recipe your own. Try melting cream cheese into the scramble (or your favorite cheese) when eggs are almost done cooking. I like to add a splash of milk to my 2 eggs, lightly whisk together, then saute until done. Move over Canter's and Langer's Delicatessen (our local deli temples to cured and sliced meats) there's a new pastrami maker in town. This is a recipe you will want to bookmark. Pete's lived in NYC and knows a good deli sandwich; and he's also been on a L.A. pastrami kick of late -- noshing at sandwich citadels all over town: from limp and waterlogged Johnnie's Pastrami Dips in Culver City, to the longtime classic at Canter's Deli on Fairfax Avenue. 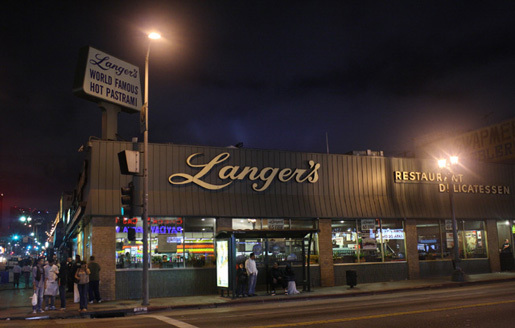 And, he thought it tasted as good as Langer's Delicatessen -- voted the top rated Pastrami Sandwich in Los Angeles! 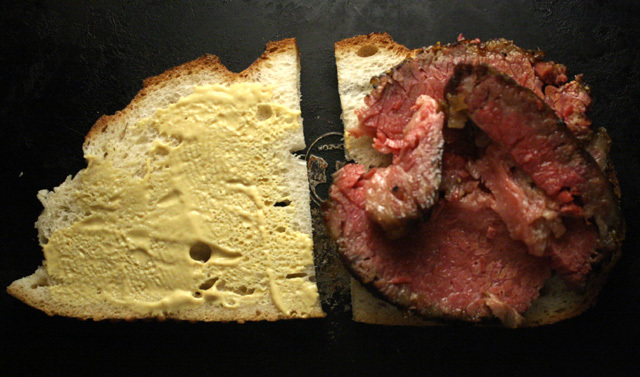 Pastrami is brined beef that is smoked and finally steamed before serving. For my easy version, I flip the recipe -- boiling the brined beef until tender then finishing with quick smoking. I've never made a Homemade Deli Pastrami, but Googleing a few recipes, it seemed simple enough. 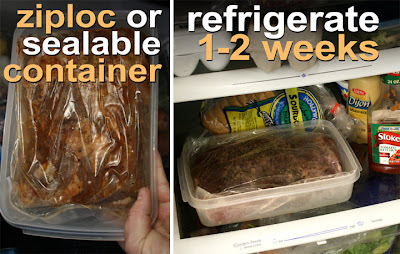 The most complicated part is easy: coat a slab of beef brisket in a dry rub of sugar, salt, coriander and plenty of black pepper; then you seal it in a Ziploc (or sealed non-metal container) for a week or two in the refrigerator. The hardest part is waiting to cook it -- especially when it will turn out so smokey, peppery and succulent. After curing, I boiled the beef for 3 hours, then applied a dry rub, and finally smoked it in my gas grill for an hour. The bright scarlet colored slices of pastrami looked as good as any deli-made. The cooked pastrami was so tender I had to carefully slice it. Pete had his pastrami with my Homemade Deli Coleslaw (recipe here) and Dijon mustard, between 2 slices of sourdough bread -- I had mine simply on sourdough with a smear of Dijon. A sandwich doesn't taste better than when stacked with smoked meat hot off the grill. A cut of corned beef or brisket needs to be slow cooked to tenderize it -- that's why it's so cheap; but when slow cooked and smoked, it is one of the most tender and tasty of meats. 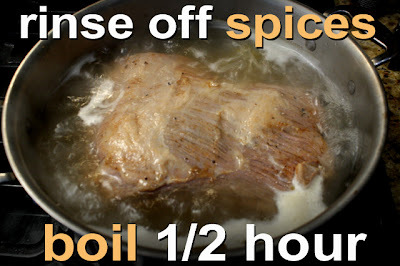 Please note that my recipe video is for untreated beef brisket, another words it's not corned. So, I take you through a few easy steps to make homemade corned beef. Hey, it's no extra charge! But if you want a shortcut to my Homemade Pastrami recipe, just get an already corned beef (especially cheap during St. Patrick's Day holidays) and skip my week-long refrigerator curing stage, and go right to the boiling stage. 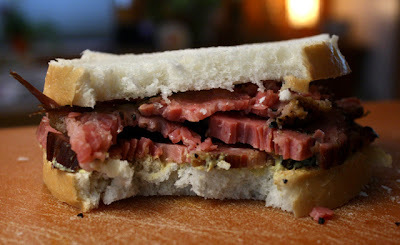 You can go to the end of this post and under Hindsight -- you'll see the packaged Corned Beef recipe version. You do need some patience though, but it's quite easy to do. And the results are worth the wait. And at the end of this post, I give you an alternate recipe for oven-baking the pastrami, for my visitors who don't have access to an outdoor grill -- it's still quite tasty. 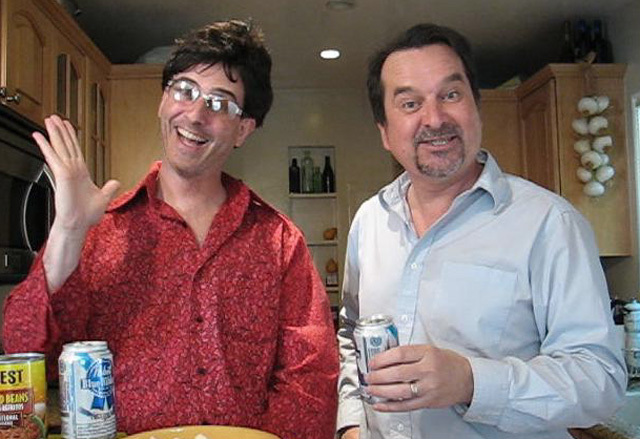 *For a no-brine-and-refrigeration quickie version, go to the end of this post. So for some of the most delicious cured beef you will ever have, watch The 99 Cent Chef latest stop motion animated opus, Homemade Deli Pastrami video, and do try making one yourself -- you will have your family and friends eating out of your hands! Play it here. Video runs 4 minutes 4 seconds. 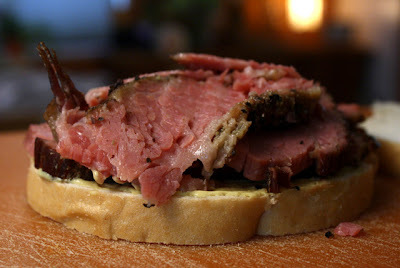 Check back for my next blogpost on what to cook with Homemade Deli Pastrami leftovers. 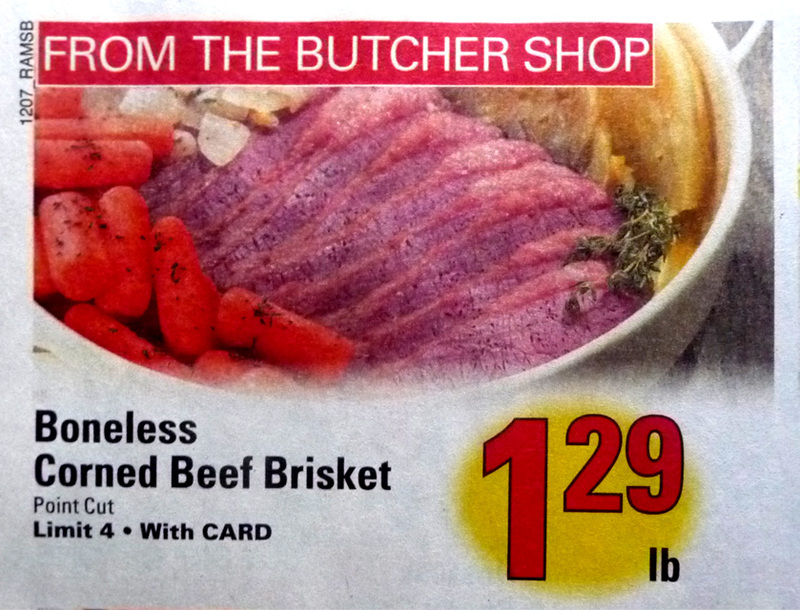 1 large brisket (or corned beef for shortcut version.) The size will vary - I've made pastrami with 4 to5 pound sizes, so far. 1/4 cup of salt - kosher preferred. I've even used regular table salt. 1 tablespoon curing salt - optional, it's to keep pink color of meat. Okay to leave out if color is not important, or if curing salt is not available. Rinse off brisket, pat dry or let it drain for a few minutes. 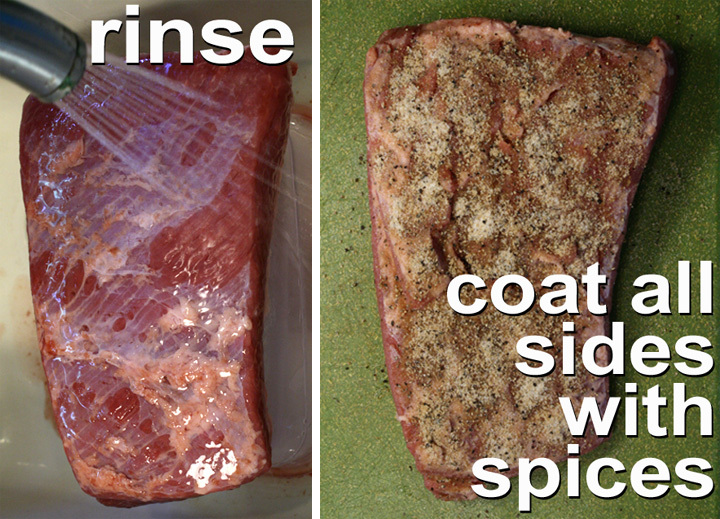 Coat all sides of brisket with curing spices. Place coated brisket in a Ziploc bag or sealable container (not metal though, use ceramic, glass or plastic.) Store coated and sealed brisket in the back of the refrigerator for at least a week. 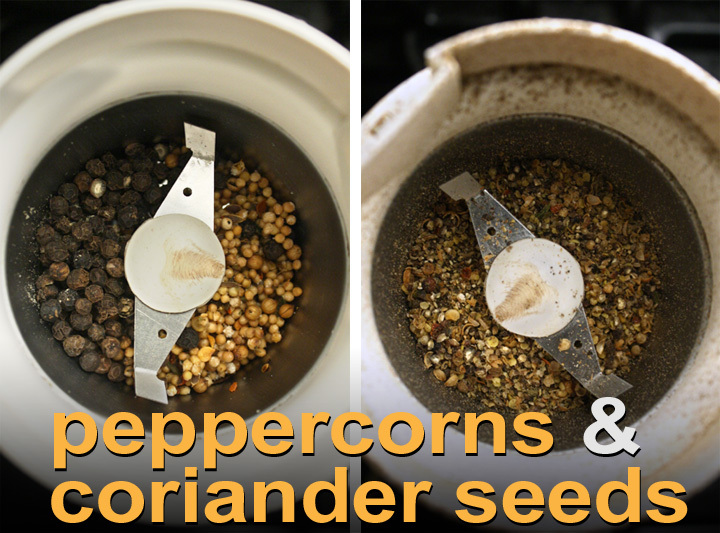 1 tablespoon ground coriander - optional. Once corned, the beef brisket has enough coriander flavor. After the brisket is cured for a week, remove from refrigerator and rinse off the meat. And if you are using an already Corned Beef just remove it from the package. Add brisket to a large pot with a cover and fill it with water to just above the meat. Bring to a boil, reduce to a low simmer and cover. Now time to smoke it. There are several ways, you mainly need an outdoor grill with a cover. I have a 2 burner gas grill. The object is to smoke the meat with indirect heat. That is, place the meat as far away from the flame as possible. The meat is already cooked, so you just want to smoke it at this stage. If you have a simple outdoor charcoal BBQ grill then build a fire way off to one side. The flame is for a pan of wood chips. 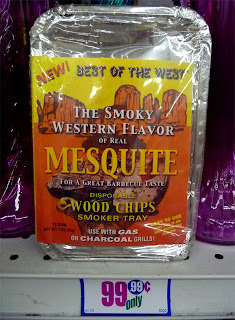 You could even loosely wrap a large handful of chips in aluminum foil and place over hot coals or the gas flame. Leave some space between flame and wood container or the wood will catch fire too easily. Depending how hot the flame is, the wood chips should start smoking in 5 to 10 minutes. 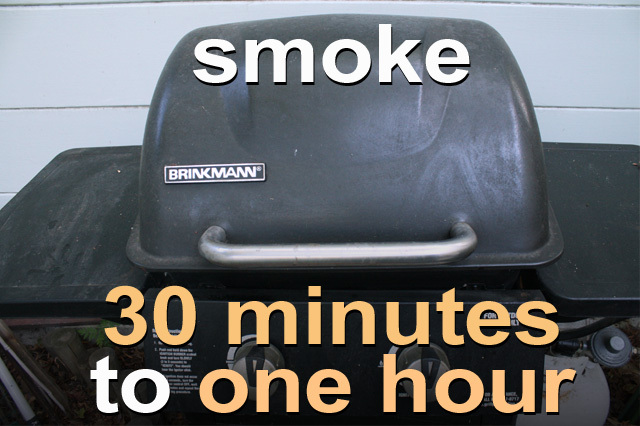 When the smoke starts, place the boiled brisket as far away from the flame as possible and cover the grill tightly. 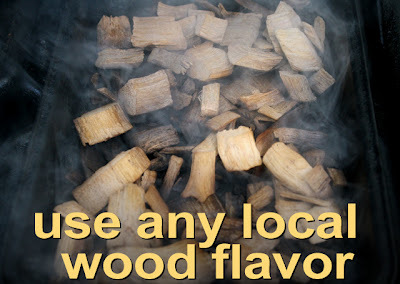 Check every 10 minutes or so and replace the wood chips with fresh ones as they cook away, if needed. I smoked my pastrami for an hour. Even just a half hour of smoking will still give you a great flavor and a crunchy crusted pastrami. 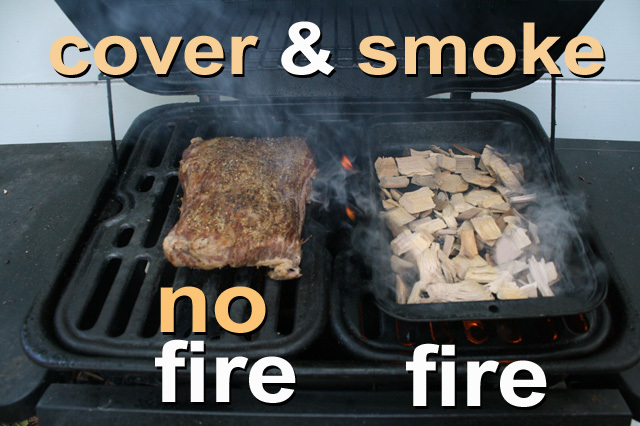 In the hour of smoking I had to replace the blackened wood chips a couple of times. The meat will still heat up and brown, even away from the heat. If you are using a coal burning grill your smoking time may be shorter, as they often burn hotter than a more controllable gas grill (about half an hour of smoking?) The length of time it takes for the wood chips to stop smoking is all the time you really need. After the pastrami is smoked, place it on a cutting board, slice across the grain, and make a big fat pastrami sandwich, your way! Curing the pastrami in the refrigerator can last one to two weeks. After curing the meat, make sure to boil the pastrami for half an hour, then totally replace the water with fresh, or it will be too salty. The trickiest part is smoking the pastrami. I do it a short amount of time so the meat doesn't dry out too much. Add the meat once the wood chips start smoking. Smoking makes the meat so flavorful, it's worth it. If you have a large enough grill with room to spare, then add a few links of sausage around the brisket -- no sense wasting any of that smoking space! If you don't have an outdoor grill you can still make a delicious pastrami. Follow my corning directions above for a fresh brisket. The easiest way is to skip the corning process and buy packaged corned beef. Follow my boiling directions above, boiling the corned beef until tender. When corned beef is tender, remove and set in on a plate or rack. 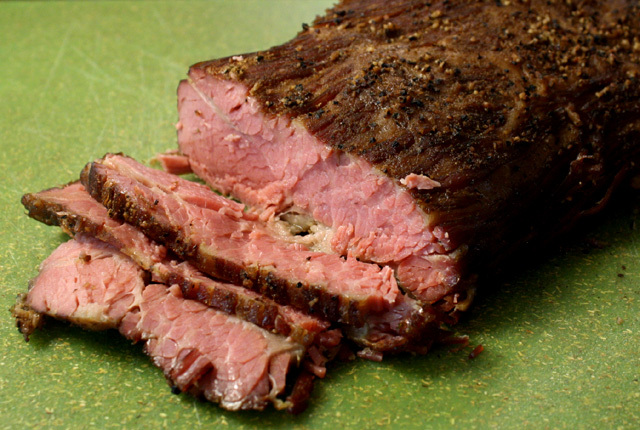 For a smoky flavor rub a tablespoon or two of liquid smoke all over the tenderized corned beef. 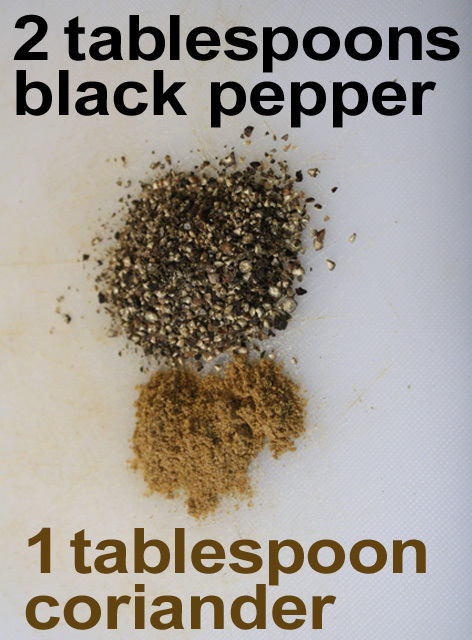 Also sprinkle on black pepper liberally, about a 2-3 tablespoons. You can add more or less to suit your taste. 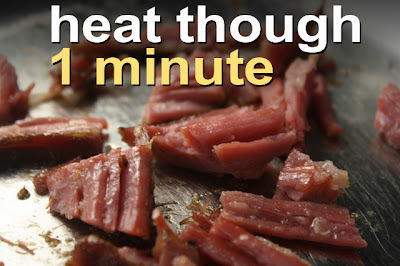 In a preheated 350 degree oven add corned beef to a baking pan or dish. Bake for about an hour until corned beef has a dry outer skin. 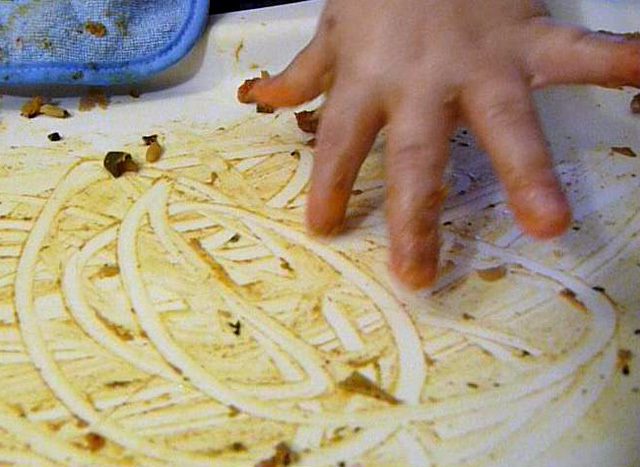 Remove from oven when done. 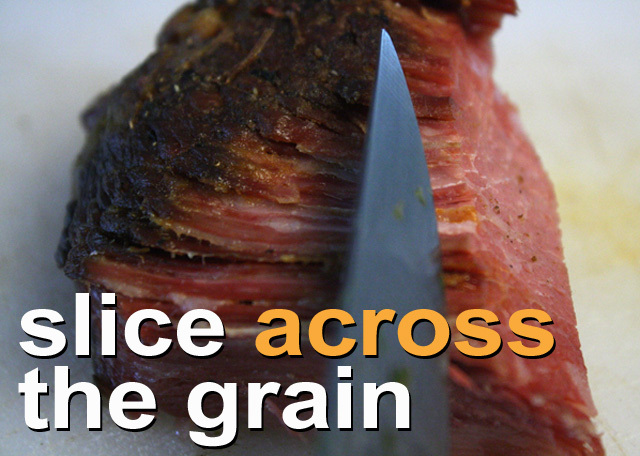 When ready to serve, slice the pastrami "across the grain", so it doesn't break apart. I like my pastrami sandwich with mustard. It's traditionally served on rye bread, but sourdough is a tasty and cheap substitution. My Deli Coleslaw recipe is a click away, here, for added veggie crunch on the side, or on the sandwich itself. I got about 4 large sandwiches from a 4 pound (uncooked weight) corned beef brisket -- you may get more depending on the sliced serving size. If you are reheating cooked pastrami, it is best to steam it covered on a steamer rack for a few minutes until warm. You could also microwave it. I like to place a hunk (or a few slices) of pastrami on a plate and cover it with a small damp paper towel, then zap it until warmed through. 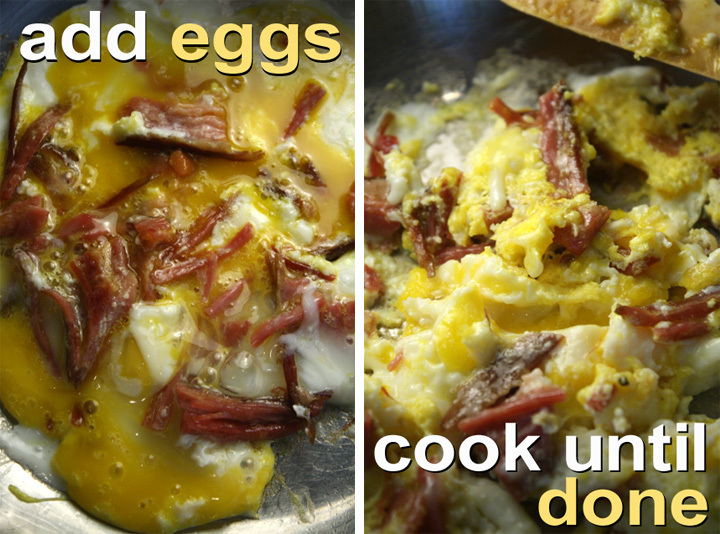 My favorite use for the trimmings of pastrami is to mix it into scrambled eggs. Check back for that recipe next week. Ground coriander is expensive. 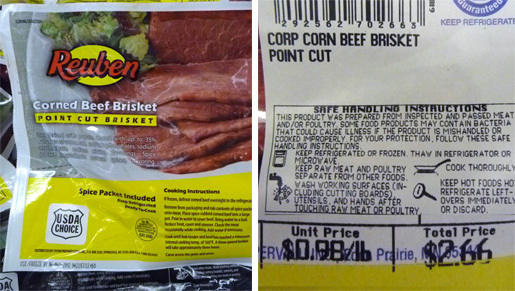 Packages of corned beef come with a spice packet that has tan coriander seeds. 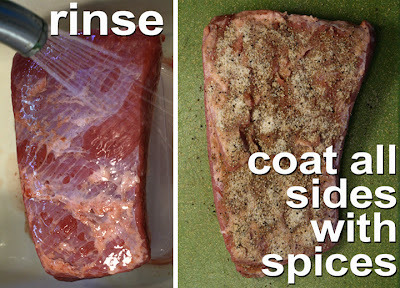 (Most corning beef directions from stuffy chefs and by-the-book newspaper food sites rail against these packets and say to toss them out -- I use them and while not perfect, the spices are flavorful enough.) 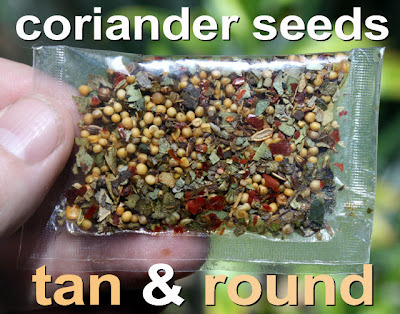 So, the cheapie way is to sort out the seeds and grind them up (hammer seeds in a plastic bag, or use a coffee grinder.) That's how cheap I am! Low boil the corned beef covered about 3-4 hours until tender. 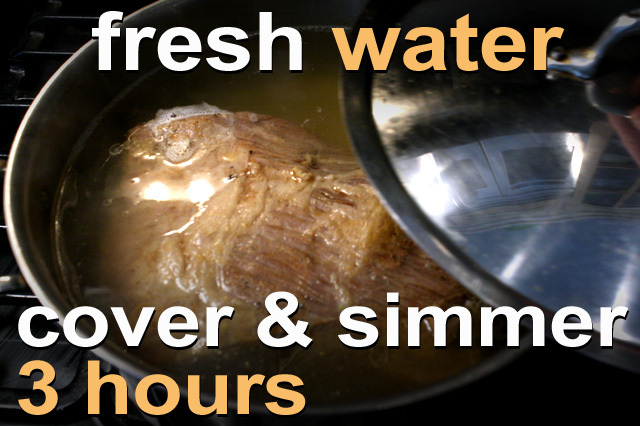 Remove from water/broth. From here you can use my smoking or baking method to finish cooking. I like to coat the brisket with a couple of tablespoons of black pepper for the smoking stage, but you can add as much (or little) black pepper as you like. My Homemade Pastrami flavor is not as intense as a Jewish deli's, but it's the next best thing and your dining guest will not know the difference -- as long as you don't spill the beans! In the dog days of summer you do not want to heat up the kitchen -- so here is a cool and cheap recipe that is perfect as a backyard or patio party appetizer, Salami or Chorizo with Melon. Normally made with expensive slices of Italian ham called prosciutto, I've found that any decent sliced cured meat on sale is an inexpensive way to go. My local 99c only Store always carries 3.5 ounce lean slices of salami (including a Tuscan Brand) and even Spanish style cured Chorizo. Both are as lean as prosciutto but with a more intense, but still pleasing flavor. And they pair nicely with cool and sweet melon. As for melon, they are on sale everywhere. 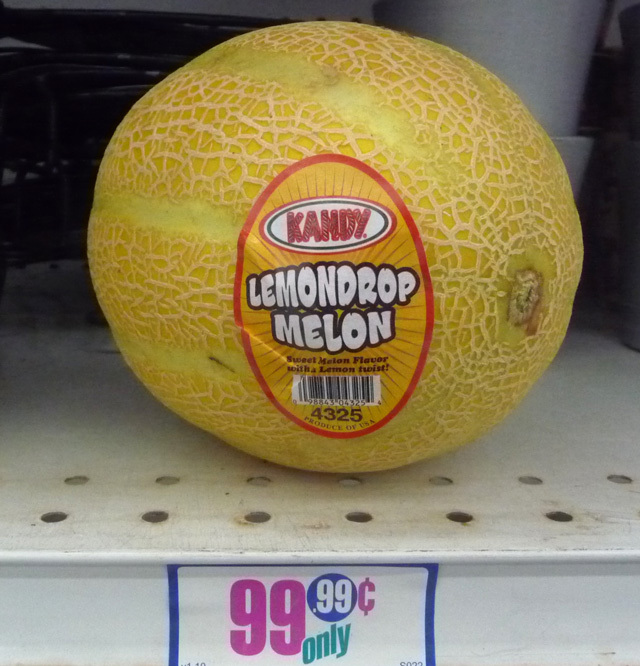 I've never tried a Lemondrop Melon. The light green flesh is firm with a hint of tart lemon flavor. While not as sweet as a cantaloupe (which I find too sweet) -- it's really quite tasty. I would get it again. As for the preparation there is nothing to it, just slice the melon, scoop out the seeds and slice to a desired thickness. You can make the melon pieces about the same length as the cured meat slices (or, if you need to stretch it out then half the salami and melon slices to make even more appetizers.) 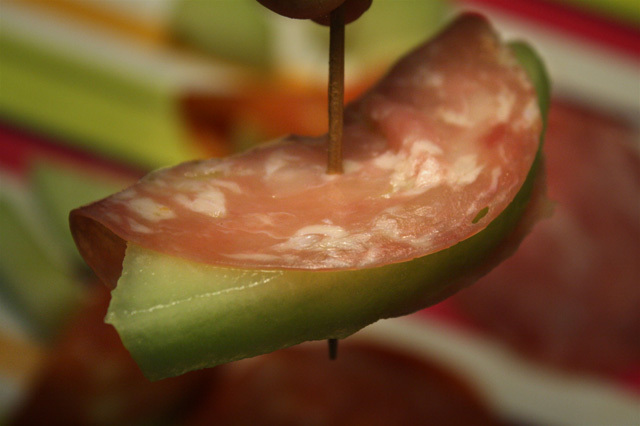 Finally just wrap a salami slice around the melon and fasten with a tooth pick. If you are serving this at a party you can prepare it a few hours ahead of time and refrigerate. So, for an interestingly cheap and cool swimming pool party appetizer, try out The 99 Cent Chef's Salami or Chorizo with Melon. 1 melon - any type on sale. 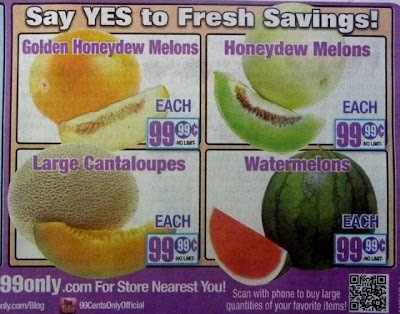 Cantaloupe, Honeydew, Lemondrop - even Watermelon. 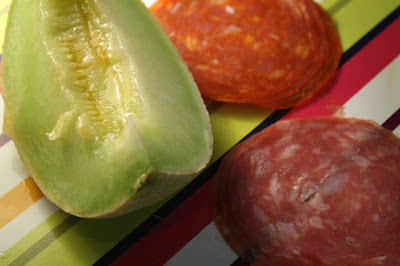 About 3.5 ounces of sliced salami or chorizo - you want thin sliced so it will easily wrap around melon. You can use any type of salami on sale. Of course you can use thin sliced prosciutto or a favorite cured meat, and even sliced ham. 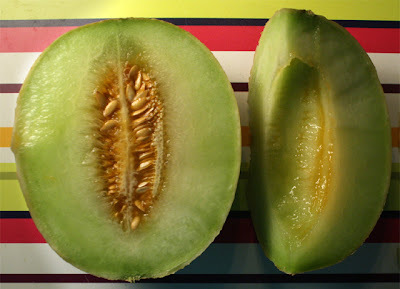 Cut melon in half and spoon out the seeds. Slice the melon to desired thickness (about 1/2 inch thick.) Trim off the rind from the melon flesh. Cut melon slices to about the same length as the salami and/or chorizo slices. 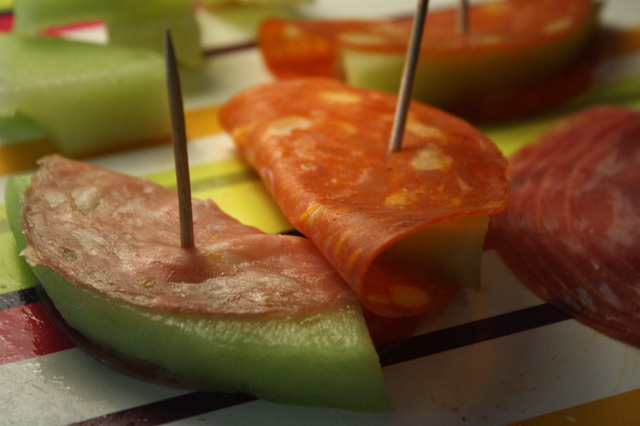 Finally wrap melon pieces with a slice of salami and spear each one all the way through with a toothpick. You can chow down right away, or refrigerate for a few hours before serving. 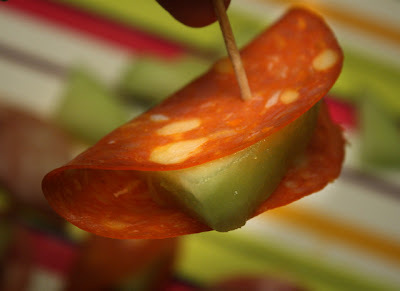 *For a smaller bite (to stretch appetizer and feed more guests,) cut salami or chorizo slices into half sizes, same with melon pieces. I'm lucky to have a lemon tree near our condo. 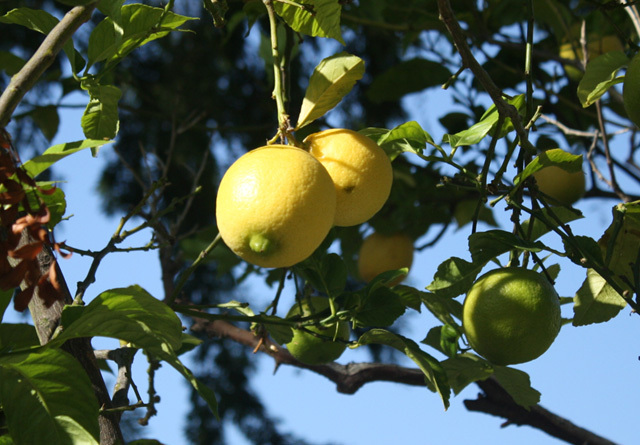 For the last couple of months clusters of lemons have been ripening. It's first-come-first-serve with the neighbors. Since my latest recipe, Chicken & Lemon Cream with Pasta, uses only one lemon, there is plenty of this tart fruit for all the neighbors to pick. Combining cream with lemon juice smooths out the sourness, giving the pasta sauce tartness and sweetness -- it's a great flavor combination. Some recipes stop there, and you can, but I thought to add a bit of poultry protein from a convenient tin. I prefer cooking with fresh chicken, but sometimes the workday is too long and a 5 ounce can of cooked chicken makes dinner come together quickly and easily. I can always get it at my local 99c only Store, so it's cheap enough (although not as economical as fresh.) You could also use some of the roasted whole cooked chicken on sale under the heat lamps you bring home from your local grocery store. 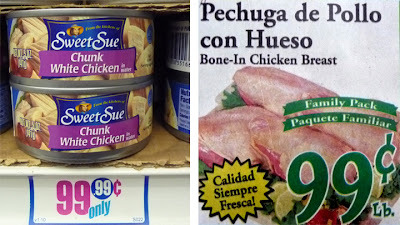 And every month my Latin market has bone-in chicken breast on sale for 99 cents per pound. Click here on the website devoted to picking fruit in public spaces for free, it's called Fallen Fruit. 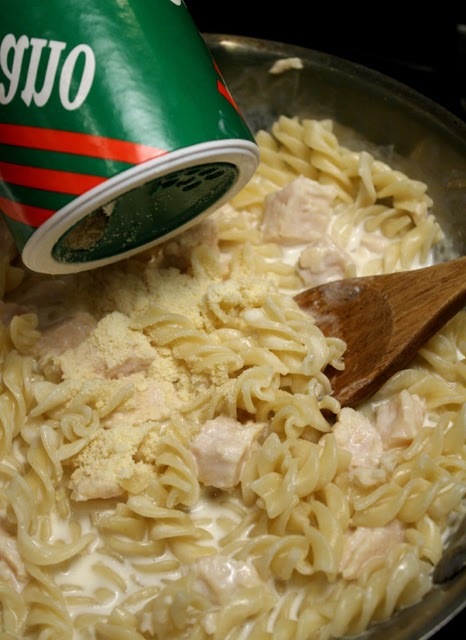 So if you are fortunate enough to have a neighborhood lemon tree around, or your farmers market and ethnic grocery have some on sale, then be sure to try out The 99 Cent Chef's delicious Chicken & Lemon Cream with Pasta. 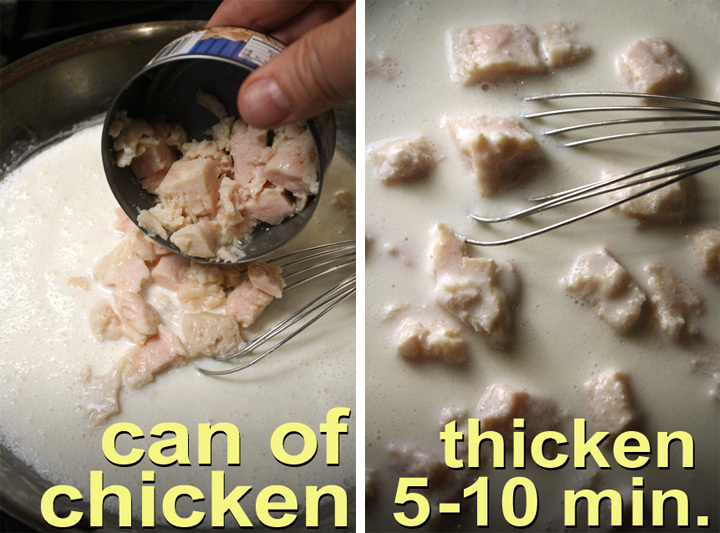 5 ounce can of chicken - *Okay to use fresh chicken, about half of a whole chicken breast. Juice of 1 lemon - about 1/4 cup, fresh or bottled. 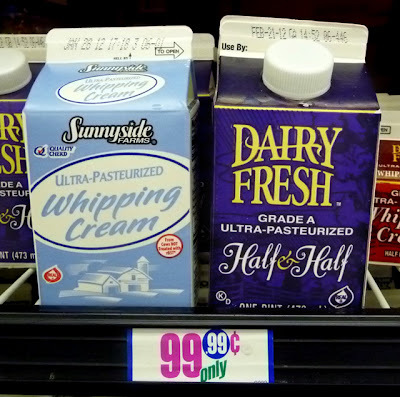 1 cup cream - whipping cream or half-and-half. Okay to use whole milk. Finish with parmesan cheese - Fresh shaved or dried. Pepper to taste - canned chicken has plenty of salt. 1/3 package of pasta - okay to add more for a big appetite. Start water for pasta and add pasta when at a low boil. Follow cooking directions -- I usually shave off a minute or two for al dente. 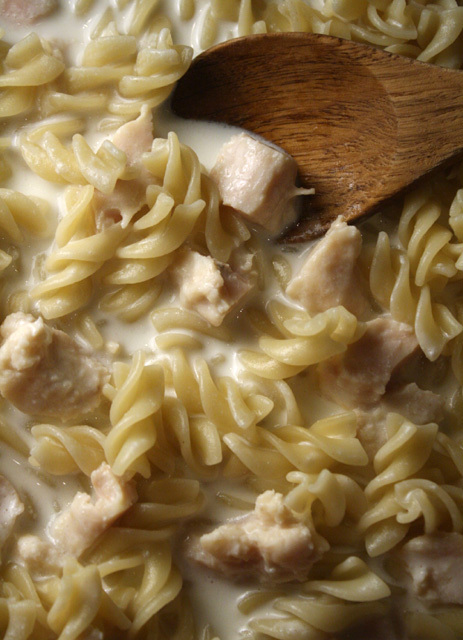 Pasta should be ready about the same time as Chicken and Lemon Cream Sauce is done. Meanwhile add cream to a saute pan over a medium heat. 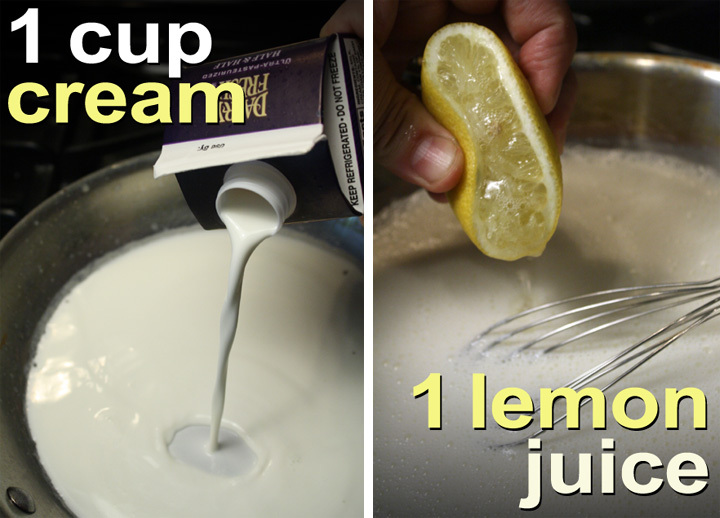 Slice lemon and slowly add juice while continuously stirring cream (so it doesn't curdle.) To keep out seeds just squeeze juice into a bowl and remove them -- this also makes adding juice a little at a time easier. No need to boil, just continue to stir cream and lemon juice until it comes to a low simmer. 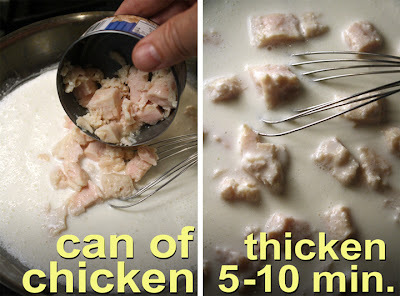 Open can of chicken and add it (including the liquid) to cream. Lightly stir until chicken is heated through, another couple of minutes. For a thick sauce, reduce liquid by a third; or just go ahead and pour it over the pasta if you are impatient and like a thinner sauce. If I am using dried parmesan I'll add it with the chicken. 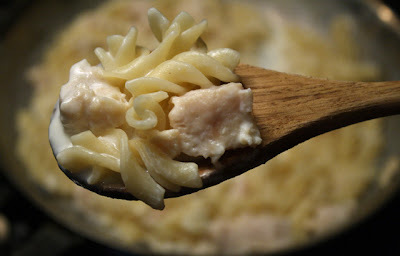 If the parmesan is fresh, then I will shave it over the finished and plated pasta. Of course you can keep this dish vegetarian and use your favorite milk substitute. And leave out the chicken and replace it with some favorite veggies like broccoli or asparagus. This Italian entree is all about a lemon infused sauce on pasta. 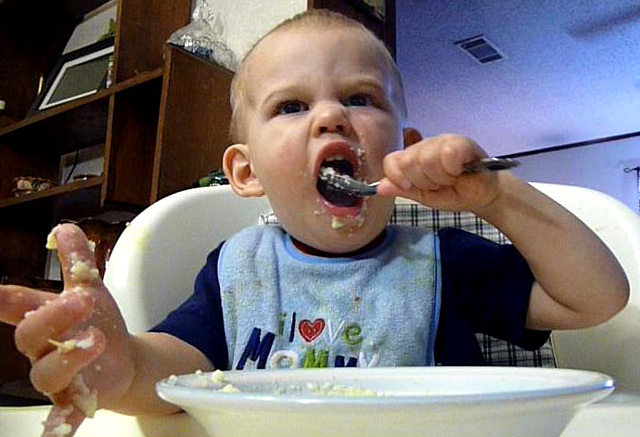 Miles, the noshing L'enfant terrible is back, and as unrestrained as ever. 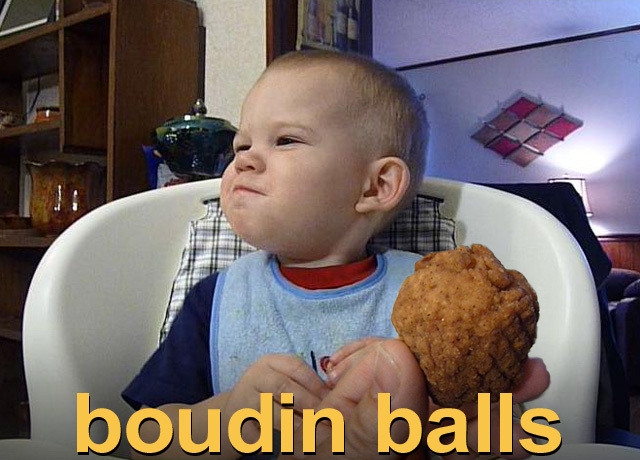 If this Cajun kid likes an entree, silverware will not slow him down -- not when he can get the job done with the help of his 10 plump digits. And if he can't finish what's on his plate then he gets creative, even Jackson Pollock would be jealous of Miles's painting technique using a tender crawfish tail dipped in a creamy bisque; or Vogue Magazine editor Anna Wintou would surely applaud Miles if he waddled down a Paris catwalk wearing the latest in Cheese Grits covered couture! The 99 Cent Chef's wild and funny video of Miles First Cajun Bite is just a click away at the bottom of this post. My nephew Chef Matt (one of his cooking videos here) and his fiance's tyke is a bundle of entertainment at a year and a half old (at the time this video was shot.) 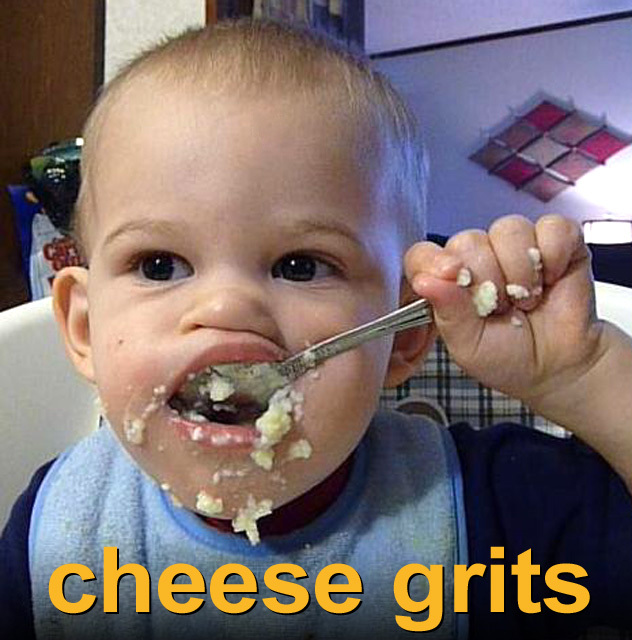 All you have to do is put him in a highchair and hilarity follows. When I was staying with Mom in Louisiana last November after her bypass surgery (all's well, she's back to bowling,) I shot Miles at her kitchen table -- this time noshing on the Cajun cuisine classics of: Boudin Balls, which are fried rice balls with ground pork; Crawfish Pie, a flaky pastry filled with tender tails of crawfish in a tomato bisque sauce; and finishing up with the Southern classic, Cheese Grits. It's anarchy of the appetite in my latest toddler First Bite video series. And deja food all over again -- if you are a subscriber then you know what I'm talking about; just click here to refresh your memory of the original Miles First Bite from 11 months ago. And if you can't get enough cuteness, I have 3 more First Bite videos of the most adorable little girl in Baldwin Hills, my neighbors Bob and Lori's one year old, Lola (just click on a title): Lola's First Bite 1.0, Lola's First Bite 2.0, and Lola's First Birthday Party. It's all good and not so clean fun, especially when you combine toddlers and vittles -- you will literally be watching a movable feast. And if there is anybody else in the room go ahead and invite them to look over your shoulder at all the culinary merriment. 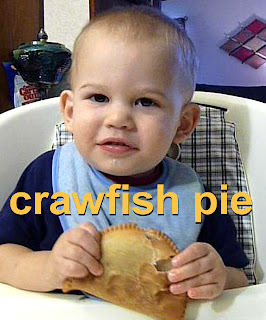 A big 99 thanks goes to Miles, Lacee and Chef Matt (and my Mom) for allowing me to video it all; and an extra 99 thanks for their help in cleaning up after Miles First Cajun Bite 2.0 !! Play it here. Video runs 4 minutes 10 seconds.